Do you have a two or three-story house ? Are you constantly finding your kid’s belongings on the main floor instead of in their rooms? This was a constant battle in our house. “Take this upstairs.” (and many other variations of the phrase had me feeling like a broken record. (Wow! That phrase ages me, I guess!) I found this idea on Pinterest and just had to make my own version. I think that I borrowed the original idea from www.haleymorgan.com, but I can’t remember for sure. Is the Word “Crap” Offensive? I hope not. If I offended anyone, I apologize. I’ll be honest, my mom was a Christian woman with very high morals, but she said the word “crap” and so do I. As a kindergarten teacher, I am often hearing children say that words such as hate and stupid are “swears”. In my family, none of those words were considered “swears”, but were also never directed at a person. There is a difference between saying “you are stupid” and “I can’t get this stupid thing to work”. The words certainly don’t have a positive connotation, but I am not completely convinced they are “swears” either. Of course, I would never tell my students this, but clearly not everyone is brought up banning those words from their vocabulary and thus we have “situations” in the classroom. I have found the same to be true with the word “crap”. I do believe the word is banned in some homes, but clearly not mine. Just to clarify, I wanted to demonstrate that there is more than one definition and when I use the word “crap”, I am referring to this definition, so don’t get your knickers in a knot. You will notice that this definition (taken from the New Oxford American Dictionary) does say “vulgar slang”, but I choose to ignore this because since when is “rubbish” vulgar? I am not sure that my children necessarily agree that their belongings fit with the definition, but for me it works. You could certainly make the baskets without using the word at all and just put their names on their baskets ~ whatever works for you. Okay, now that we got that out of the way….we can actually get to the project. 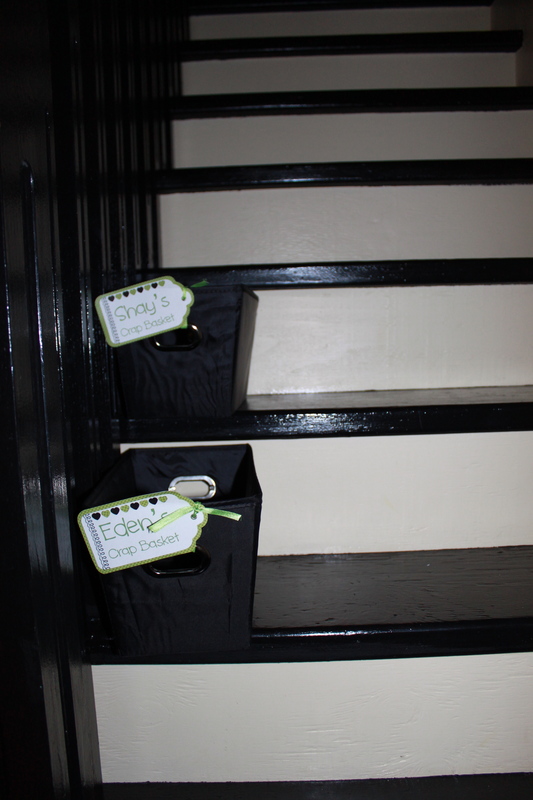 I loved the original poster’s idea to use wicker, but thought that the baskets would probably scratch my painted stairs, so I opted for a little dollar store tote. It looks like one of those canvas ones, but it is actually not…I think it is some kind of a nylon fabric (can be wiped). I simply printed the words on my computer and used my Cricut machine to cut-out the tags. I then used a stamp, eyelet, ribbon and hearts to embellish them. They were super easy and have been very durable. The baskets sit on the stairs and it is the kid’s job to take up their basket, put away their belongings and return them to the stairs. I find the baskets work really well. 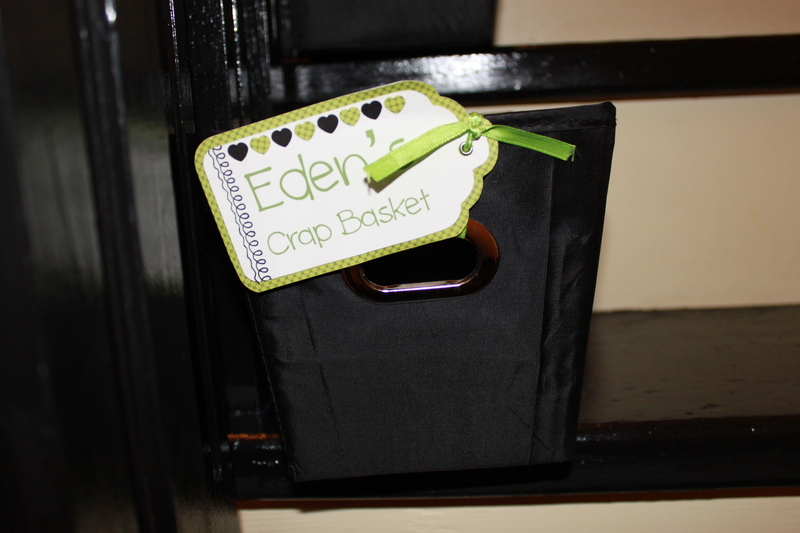 Anytime, I find a bottle of nail polish, book, toy, etc., I just pop it in their “crap basket”. I no longer have to hound them, but rather just pop their things in their baskets. We have never found them to be in the way either. Posted on September 1, 2013 by Cindy Roy •	This entry was posted in Family, Home Decor and tagged crap baskets, DIY crap baskets, family organization, home decor, organization, stair baskets. Bookmark the permalink.